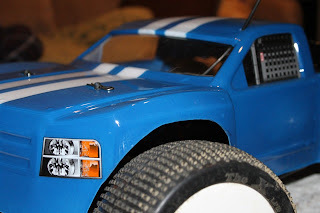 For the past several months Ive been taking an interest in RC cars. It has escalated from interest to an obsession which I don't consider to be a bad thing. I have always liked cars ever since I was small and my auntie bought me several as a gason but none like the ones I have now. The one in the pictures is some what of a mongrel as I have changed and added a lot of parts to upgrade the beast. Probably the biggest two changes are the battery pack and the motor. 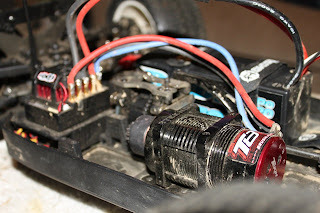 The motor is the Tekin RX8 brushless motor which is capable of pushing almost any RC car to 65 mph plus. 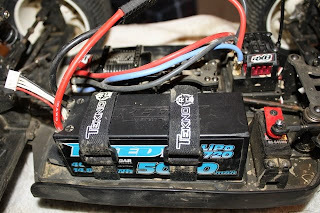 That speed can only be reached with Lipo Battery power. The one I have is the Reedy 14.8 volt. Its like 1/8 the size of a real car battery. It is insane !! 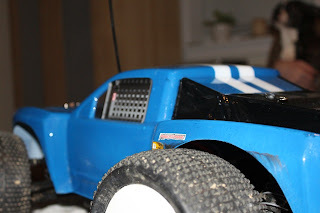 Rootin with the cars keeps me busy and out of trouble and I think its great. So lick my balls.